A regular breeding species and migrant in Minnesota’s forests. The Wood Thrush was an uncommon species during Minnesota’s Breeding Bird Atlas (MNBBA). Broadly distributed across the eastern United States from the eastern Great Plains to the Atlantic coast. In the Great Plains, it is usually found along the riparian corridors of major rivers. In Canada, it is found from southern Ontario east to southern Nova Scotia. Wood Thrushes reach their highest breeding densities in the central Appalachian Mountain region and in central Mississippi (Figure 1). A long-distance migrant that winters in Central America. Omnivore that consumes a variety of insects, primarily soil invertebrates, and fruits while foraging on the ground and in the understory foliage. Open-cup nest usually placed in a deciduous tree or shrub at a height of 2 to 5 m.
Breeding distribution and relative abundance of the Wood Thrush in North America based on the federal Breeding Bird Survey, 2011–2015 (Sauer et al. 2017). Roberts (1932) commented extensively on the distribution of the Wood Thrush in Minnesota. He described it as an abundant breeding species throughout the deciduous forest region, nesting as far north as the southern limit of the coniferous forests of northern Minnesota. It also nested in scattered woodland groves in western Minnesota. Roberts witnessed a gradual northward expansion of the species’ range as northern forests were harvested and replaced with younger aspen-birch stands more suitable for this deciduous forest–loving species. Exactly when the northward expansion began was unclear. “Several observers some years ago,” he wrote, “reported the Wood Thrush at localities well within the Canadian Zone, [such] as Leech Lake and the Crooked Lake region in northern Cass County, but as these records were made upon song-identification, they were not regarded as conclusive.” He was referring specifically to the similarity between the song of the more southerly distributed Wood Thrush and the more northerly distributed Hermit Thrush. Considered among the most eloquent of bird songs, both have an ethereal quality that has been lauded by naturalists for hundreds of years. To the untrained ear, however, they can sound remarkably similar. So it wasn’t until Roberts had credible reports from well-trusted colleagues that he accepted the evidence that Wood Thrushes were indeed expanding northward. Acceptable reports came from the Mille Lacs region (1926), and from Pine (1919) and Itasca Counties (1930). Roberts also commented extensively about the distribution of Wood Thrushes in western Minnesota. Found along the Minnesota River west to Chippewa County, they occupied woodland groves throughout the southwest region, including in Jackson, Lac qui Parle, Lincoln, and Murray Counties. Despite extensive searches farther north, “the conclusion is that it is but a rare local wanderer north of the Minnesota River Valley.” Statewide, confirmed nesting records (nests with eggs) were available from just 5 counties: Goodhue, Fillmore, Hennepin, and Houston in southeastern Minnesota, and Itasca County in north-central Minnesota. An inferred nesting report (nest only) was reported from Wabasha County. By 1939, Olga Lakela reported the species in Duluth, where it likely nested in a maple-basswood forest along the Skyline Parkway (Lakela 1939). But few additional summer records in northern counties were reported until the 1960s and 1970s, when scattered sightings came from Aitkin County, southern St. Louis County, and Cook County (Minnesota Ornithologists’ Union 2016). In 1975, Green and Janssen reported Wood Thrushes were most abundant in southeastern Minnesota, from Hennepin County south to the Iowa border. North and west of this region reports were sparse despite the apparent availability of suitable habitat. Recent records from hardwood stands along the North Shore of Lake Superior were believed to represent an expansion in the knowledge of the thrush’s distribution rather than an actual expansion in its breeding range. In the extensively forested landscape that extended north and west of Lake Superior’s shoreline, the species had yet to be reported. Janssen’s updated account in 1987 noted an increase in reports from southwestern Minnesota, suggesting the species might be expanding its range farther west along the Minnesota River valley. Nesting had even been recently documented farther south in Jackson County. Yet, given Roberts’s earlier accounts of Wood Thrushes in this region, the species might simply have been reoccupying portions of its’ former range following a period of intensive agricultural development. Elsewhere, little change was observed in the species’ distribution. Since 1970, Janssen identified 11 counties where nesting had been confirmed: Anoka, Brown, Clearwater, Crow Wing, Hennepin, Houston, Jackson, Nicollet, Ramsey, St. Louis, and Washington. By 1998, Hertzel and Janssen added another 7 counties to the list: Becker, Beltrami, Dakota, Lac qui Parle, Polk, Rice and Winona. By 2014, the Minnesota Biological Survey (MBS) had reported 422 breeding season locations for the Wood Thrush. Included were numerous records throughout the Laurentian Mixed Forest Province, from Clearwater and southern Beltrami Counties, east through Itasca and southern St. Louis, Lake, and Cook Counties. The survey had yet to complete its work in the far north-central counties. Farther south, Wood Thrushes were common also along the upper Minnesota River valley as far as Yellow Medicine County (Minnesota Department of Natural Resources 2016). During the MNBBA, observers reported a total of 585 Wood Thrush records in 9.2% (434/4,738) of the surveyed atlas blocks and in 12.4% (290/2,337) of the priority blocks. Breeding evidence was confirmed in 14 blocks (Figures 2 and 3; Table 1). The species was reported in 64 of Minnesota’s 87 counties and was documented nesting in 11 counties (1 block straddled 2 counties, Dakota and Scott). Six counties were additions to Hertzel and Janssen’s 1998 list: Cass, Itasca, Kandiyohi, Lake, Scott (included because of the block that straddled both Dakota and Scott), and Wright. Contrary to earlier accounts, the largest number of observations was now reported from the northern Laurentian Mixed Forest Province. Overall, the species distribution during the MNBBA was very similar to that reported by the MBS. The MNBBA predicted distribution map (Figure 4) predicted moderate breeding densities in scattered pockets throughout the southern and western regions of the Laurentian Mixed Forest Province. The species was predicted to be present in low breeding densities elsewhere throughout the province as well as in scattered regions of the Eastern Broadleaf Forest Province, from the southeastern corner of the state northwest to Becker, Mahnomen, and Otter Tail Counties. Further west, low densities are also predicted along the prairie-forest transition region in west-central Minnesota and along the portions of the Minnesota River valley. Clearly, the past 100 years has witnessed a major shift in the Wood Thrush’s distribution in the state. The extensive conifer and mixed coniferous-deciduous forests that covered the northern forest landscape in the late 1800s and early 1900s were unsuitable for the hardwood-loving Wood Thrush. Minnesota’s southern mesic hardwood forests comprised of sugar maple, American elm, basswood, and red oak provided ideal habitat as the species extended the periphery of its breeding range north along the Mississippi River drainage. Then, as agriculture and residential development cleared much of the southern Big Woods, Wood Thrushes gradually moved northward as second-growth aspen-birch-fir stands replaced the large pineries of the north woods. The northern expansion observed in Minnesota was also documented in several New England states (New Hampshire, Vermont, and, more recently, Maine) and in the Canadian provinces of Ontario and New Brunswick (Evans et al. 2011). The species’ history in Wisconsin was similar to that documented in Minnesota. Originally it was a common species in southern and central Wisconsin and scarce farther north. Yet, by 1991, Robbins (1991) reported that breeding densities in the northern counties were four times those in the south. Several years later, however, the first state atlas (1995-200) documented the species’ absence from large areas of northern Wisconsin (Cutright et al. 2006). Contrary to the changes observed in Minnesota and Wisconsin, little change in the distribution of Wood Thrushes in the past 100 years was noted in Michigan (Chartier et al. 2013). Breeding distribution of the Wood Thrush in Minnesota based on the Breeding Bird Atlas (2009 – 2013). Summary statistics of observations by breeding status category for the Wood Thrush in Minnesota based on all blocks (each 5 km x 5 km) surveyed during the Breeding Bird Atlas (2009-2013). Summary statistics for the Wood Thrush observations by breeding status category for all blocks and priority blocks (each 5 km x 5 km) surveyed during the Minnesota Breeding Bird Atlas (2009-2013). Predicted breeding distribution (pairs per 40 hectares) of the Wood Thrush in Minnesota based on habitat, landscape context, and climate data gathered during the Minnesota Breeding Bird Atlas (2009-2013) using the General Linear Modeling method with an adjustment for detectability. The Wood Thrush is associated with deciduous and mixed forests, showing a strong preference for mature mesic uplands. Conifers may be present but rarely dominate suitable sites. A major study conducted across the species’ breeding range found 53% of occupied sites were deciduous forests, 45% were mixed forests, and 1% were coniferous forests (Rosenberg et al. 2003). Forest structure may be more important to the species than forest composition. James and her colleagues (1984) broadly described the Wood Thrush’s habitat as composed of “a well-shaded understory that contains at least a few small trees with low, exposed branches and a fairly open forest floor with moist, decaying leafy litter.” The authors stressed the importance of these features to this ground-foraging species that nests on the “open branches of understory trees.” The highest Wood Thrush breeding densities were associated with upland mesic forests with “a well-developed but sparse understory.” Evans and her colleagues (2011) noted the following key vegetation features: a diverse canopy of tall trees (>16 m in height), moderate density of understory shrubs and saplings, and sufficient shade. Again, they pointed out the importance of a fairly open and moist forest floor with a well-developed layer of leaf litter where the thrush can probe for soil invertebrates. Such conditions are frequently found in mature and old-growth forest stands, but also characterize forests with small-scale disturbances (Rosenberg et al. 2003). The National Forest Bird (NFB) Monitoring Program conducted in Wisconsin and Minnesota demonstrated a wide range of forest cover types used by the species. Although upland hardwood stands were most frequently selected, Wood Thrushes were commonly found in lowland hardwoods, beech-maple-birch, and hemlock; a small number were even associated with white pine and open wet habitats that can include bogs (Niemi et al. 2016). Habitat data collected within 200 m of MNBBA point counts where Wood Thrushes were detected also illustrate the species’ wide habitat tolerance (Figure 6). They were most closely associated with lowland conifers, northern hardwoods, and northern mixed forest stands. Although many accounts stress the species association with hardwood forests, Niemi and his colleagues (2016) clearly demonstrated that coniferous stands are either used or are in close association with the upland and lowland hardwood stands that are frequently cited as prime habitat. The lowland conifer class delineated by MNBBA can also include a deciduous component, especially black ash. The Wood Thrush is considered by some to be an area-sensitive species. Highly suitable sites are at least 80 ha in size; suitability declines in stands that are less than 40 ha (Rosenberg et al. 2003). Nevertheless, on the spectrum of area sensitivity, Wood Thrushes may be less sensitive than other forest-nesting songbirds because they frequently nest in forest fragments as small as 0.3 ha and along woodland edges (Temple 1986; Roth 1987; Robbins et al. 1989; Rosenberg et al. 2003). Although Wood Thrushes may be found in small stands, at least one study demonstrated that reproductive success was significantly lower in small stands due to high rates of predation (Weinberg and Roth 1998). Typical breeding habitat of Wood Thrush in Minnesota (© Lee A. Pfannmuller). Habitat profile for the Wood Thrush based on habitats within 200 m of point counts where the species was present during the Minnesota Breeding Bird Atlas (2009-2013). Biologists have used data gathered by the federal Breeding Bird Survey (BBS) since 1966 to generate a North American population estimate for the Wood Thrush of 12 million birds (Rosenberg et al. 2016). In 2013, Minnesota’s population was estimated at 70,000 breeding adults (Partners in Flight Science Committee 2013). The statewide population estimate derived using the MNBBA data generated a much higher estimate of 198,000 breeding adults (95% confidence interval of 155,000 – 254,000 adults). Despite being a widespread species throughout the forested regions of Minnesota, the Wood Thrush remains an uncommon and relatively sparsely distributed species (Figure 1). An average of less than 1 bird is detected per BBS route conducted in Minnesota each year. That compares to an average of 19 birds per BBS route in the Appalachian Mountain Region, the core of the species’ breeding range (Sauer et al. 2017). At the local level, breeding densities range from 4 to 20 breeding pairs per 40 ha, but densities as high as 84 breeding pairs per 40 ha have been reported (Evans et al. 2011). The NFB Monitoring Program on the Chippewa and Superior National Forests documented an average of 0.4 pair per 40 ha on the Chippewa National Forest, and 0.1 pair per 40 ha on the Superior National Forest. This compares to an average of 4.4 Veery pairs per 40 ha on the Chippewa, and 3.5 on the Superior. The Veery was the most common forest thrush on both national forests, followed by the Hermit Thrush (Niemi et al. 2016). Because of the species’ relatively low abundance in Minnesota, statistical analysis of the statewide population trend lacks precision, although it strongly suggests an increasing population. Data from the NFB Monitoring Program on the Chippewa National Forest corroborate this trend with a forest-wide significant increase of 4.43% per year from 1995 to 2016 (Figure 7). On the Superior National Forest, data suggest a small decline, while the regional trend is positive. This is in stark contrast to the species’ declining population trend throughout much of its breeding range. Since 1966, the population has declined an average of 1.91% per year (Figure 8). 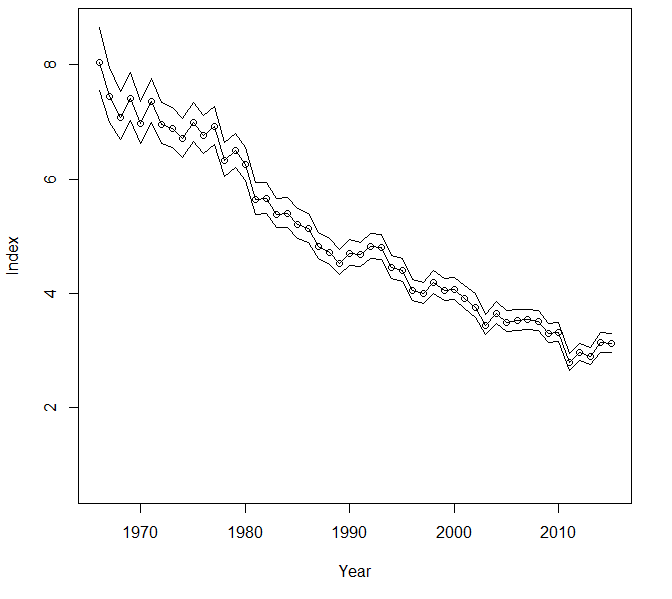 Its cumulative decline from 1970 to 2014 is estimated at 60% (Rosenberg et al. 2016). As Figure 9 illustrates, the decline is widespread throughout much of the eastern United States and southeastern Canada. Minnesota, Iowa, and Illinois are among the few states where populations are faring much better. Loss of eggs and young as a result of high predation rates in fragmented forest landscapes is considered the factor most responsible for the range-wide declines. Nests that are not predated often sustain high levels of parasitism by Brown-headed Cowbirds, further contributing to low reproductive success. In a study conducted in Delaware, these losses resulted in fewer adult females returning to the same breeding site the following year, a loss that was not compensated by an influx of new birds from successful nests the previous year or from immigration (Roth and Johnson 1993). Loss of habitat on the wintering grounds may be exacerbating the declines even further (Evans et al. 2011). The association between reproductive success and the size of a forest stand appears more complex than a simple linear relationship. Numerous studies demonstrate that Wood Thrushes also respond to the amount of fragmentation across the entire landscape and that their response to landscape variables may vary in different geographical regions (Evans et al. 2011). 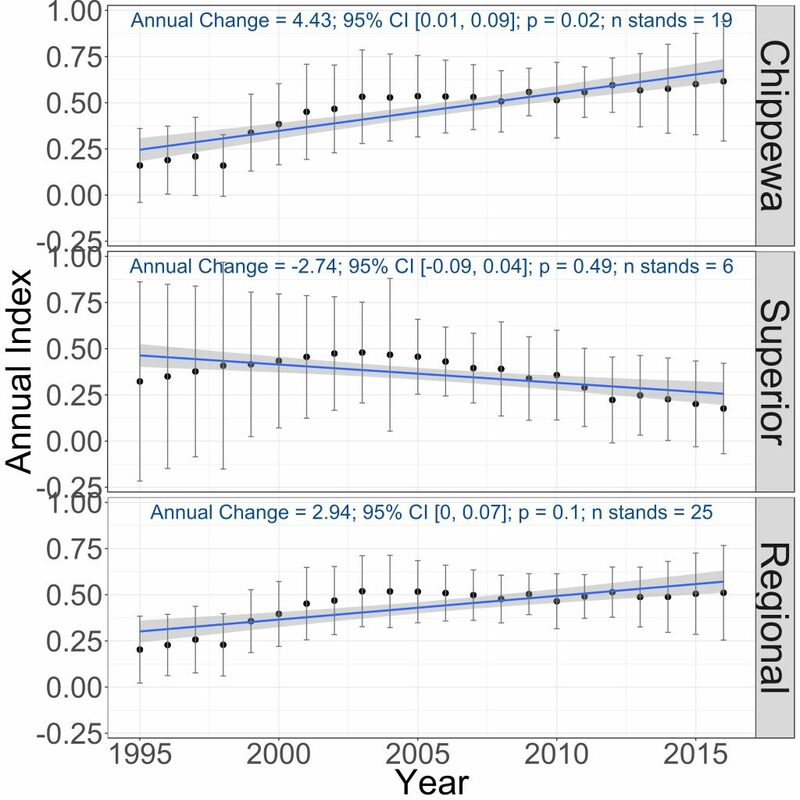 Breeding population trends of the Wood Thrush in the Chippewa and Superior National Forests and the combined regional trend, 1995–2016 (Bednar et al. 2016). Breeding population trend for the Wood Thrush in North America for 1966–2015 based on the federal Breeding Bird Survey (Sauer et al. 2017). Population trend map for the Wood Thrush in North America for 1966–2015 based on the federal Breeding Bird Survey (Sauer et al. 2017). Given its significant, widespread population decline, the Wood Thrush has garnered considerable attention at the state, regional, and federal level. In Minnesota, it has been designated a Species in Greatest Conservation Need (Minnesota Department of Natural Resources 2015). At the regional level, the U.S. Fish and Wildlife Service designated it a Midwest Bird of Management Concern (U.S. Fish and Wildlife Service 2017), and the Upper Mississippi Valley and Great Lakes Region Joint Venture designated it as a focal species (Potter et al. 2007). At the federal level, Partners in Flight added it to their 2016 Yellow Watch List and assigned it a relatively high Continental Concern Score of 14/20 (Rosenberg et al. 2016). Biologists stress that conservation efforts need to focus on the Wood Thrush’s entire life cycle, from protecting mature, broad-leaved tropical forests in Central America to protecting mature, temperate deciduous forests in the eastern United States and Canada. Specific management recommendations focus on maintaining forest stands that are a minimum of 80 to 100 ha in size (Rosenberg et al. 2003; Evans et al. 2011). Selective harvesting of stands may be beneficial in promoting more growth in the shrub layer, but clear-cutting and heavy selective harvesting are not recommended (Rosenberg et al. 2003). In Minnesota, protection and management of large, mature hardwood stands are important, particularly in southern Minnesota where urbanization continues to infringe on woodland habitats. Yet, even when stands are protected, they are not immune from the impact of invasive earthworms. The Wood Thrush is an understory species, heavily dependent on a rich and well-developed litter layer for foraging. Mesic hardwood stands preferred by thrushes are characterized by their rich, spongy layer of organic material created as leaves decompose. Unfortunately this provides ideal conditions favored by earthworms, which can severely reduce and even eliminate the duff layer when densities are high, rendering stands less suitable for Wood Thrushes and other plants and animals dependent on a rich forest floor. The Wood Thrush is also vulnerable to the projected impacts of climate change. In a comprehensive assessment of North American birds, the National Audubon Society classified the Wood Thrush as “climate threatened.” By the year 2080, approximately 82% of its current summer range could be lost, forcing it to find suitable habitat farther north in the Canadian boreal forest (Langham et al. 2015; National Audubon Society 2016). Although Minnesotans are lucky to be witnessing an increase in the statewide population of Wood Thrushes, vigilance is needed to ensure that this beloved forest songster remains an important component of the state’s avifauna in years to come. James, Frances C., Richard F. Johnston, Noel O. Wamer, Gerald J. Niemi, and William J. Boecklen. 1984. “The Grinnellian Niche of the Wood Thrush.” American Naturalist 124: 17–47. Lakela, Olga. 1939. “The Wood Thrush at Duluth.” Flicker 11: 22. Rosenberg, Kenneth V., Ralph S. Hames, Ronald W. Rohrbaugh Jr., Sara Barker Swarthout, James D. Lowe, and André A. Dhondt. 2003. A Land Manager’s Guide to Improving Habitat for Forest Thrushes. The Cornell Lab of Ornithology. Roth, Roland R. 1987. “Assessment of Habitat Quality for Wood Thrush in a Residential Area.” In Integrating Man and Nature in the Metropolitan Environment: Proceedings of a National Symposium on Urban Wildlife, 4–7 November 1986, Chevy Chase, Maryland, edited by Lowell W. Adams and Daniel L. Leedy, 139–149. Columbia, MD: National Institute for Urban Wildlife. Roth, Roland R., and R. Kent Johnson. 1993. “Long-term Dynamics of a Wood Thrush Population Breeding in a Forest Fragment.” Auk 110: 37–48. Temple, Stanley A. 1986. “Predicting Impacts of Habitat Fragmentation on Forest Birds: A Comparison of Two Models.” In Wildlife 2000: Modeling Habitat Relationships of Terrestrial Vertebrates, edited by Jared A. Verner, Michael L. Morrison, and C. John Ralph, 301–304. Madison: University of Wisconsin Press. Weinberg, Howard J., and Roland R. Roth. 1998. “Forest Area and Habitat Quality for Nesting Wood Thrushes.” Auk 115: 879–889.